Discussion in 'UFC Discussion' started by Pingu, Aug 4, 2015. Edit: It's right after her last fight if anyone missed that! Edit2: Thanks for making the image bigger guys! 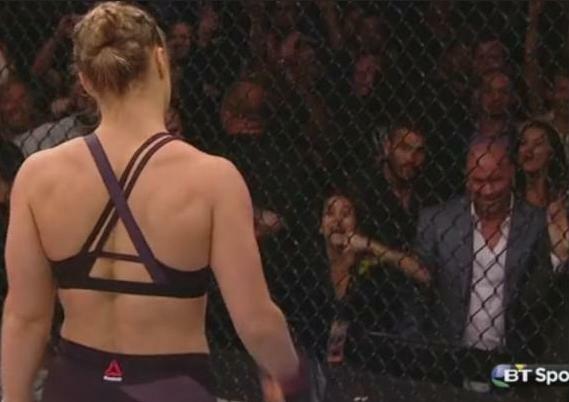 The Rousey-Tate 2 fight is worth a rewatch on its own because of the Fertitta brothers' ringside reactions all the way through it. How often do you see Lorenzo doing this? Awesome. was dana trapped in a tanning machine? Someone has been doing their back rows. ^You're linking to the .php URL so it won't work after a certain amount of time elapses. That's why I re-upped to Imgur. Allright, thanks man! I'm not exactly what one would call computer savvy. all the aphex twin references are spot on. that's what i came in here to post. I think this is what's called a "Sh|t Eatin' Grin". He's thinking of all the money UFC is going to make from her and Conor. She should renegotiate her contract, that's for sure.